As previously announced, WWE 2K18 is in development for Nintendo Switch, but fans have been left wondering when they could get their hands on the game. The answer is finally here! WWE 2K18 will be available for Nintendo Switch this week as it rolls out worldwide in physical and digital formats starting December 6*. Those who pre-order the physical version of WWE 2K18 on Nintendo Switch will receive two playable versions of WWE Hall of Famer Kurt Angle: his WWE “American Hero” persona (2001) and his ECW “Wrestling Machine” persona (2006)‡. Digital WWE 2K18 customers will be able to download the Kurt Angle pack at no additional cost through December 13, 2017. The MyCAREER experience puts you on the path to greatness as you journey along on the road to WrestleMania. Explore WWE like never before through a free-roaming backstage, conversing with WWE Superstars, forming alliances, making enemies, seeking out quests, and strategizing for upcoming matches. Introducing the all-new Road to Glory! Compete with opponents online to improve your MyPLAYER by earning unlockables, boosts, and upgrades, all while securing your entry into special events that are held alongside real-life WWE special events, such as pay-per-views. Dominate the ring with TONS of your favorite WWE, NXT and legendary Superstars! We’re not kidding. WWE 2K18 offers the most complete roster of the biggest and brightest WWE and NXT Superstars and Legends to ever grace a WWE ring! Recreate the WWE broadcasting experience in Universe. WWE Raw, SmackDown Live and NXT shows happen every week with Superstars competing against one another. Incorporate custom Superstars, tag teams, championships, arenas and shows to create your personal WWE experience. We have a variety of exciting options for Nintendo Switch players at launch. Physical pre-orders are available now from several retailers, while the digital version will be available this week. Pre-order the physical version and get access to the Kurt Angle pack‡. Purchase the digital version and download the Kurt Angle pack from the Nintendo eShop at no additional cost through December 13, 2017. WWE 2K18 Cena (Nuff) pack, including two playable versions of John Cena (ECW One Night Stand and WrestleMania 26) and playable characters Batista and Rob Van Dam. Available for purchase on launch day for $29.99, a savings of over 23% percent versus individual content purchases. Players will receive the items as they become available on the Nintendo eShop. Two playable versions of WWE Hall of Famer Kurt Angle: his WWE “American Hero” persona (2001) and his ECW “Wrestling Machine” persona (2006). Available for purchase for $4.99 after December 13th, 2017. This pack is available at no additional cost to anyone that purchases WWE 2K18 prior to December 13, 2017. Available for purchase on launch day for $7.99. Available for purchase on launch day for $4.99. Available for $9.99 at a later date. Available for purchase on launch day for $9.99. Available for $3.99 at a later date. *Release date may vary by territory. ‡Physical edition customers will receive their pre-order codes on receipt or via email. †Nintendo account and Internet connection required. Copy of WWE 2K18 required to play. 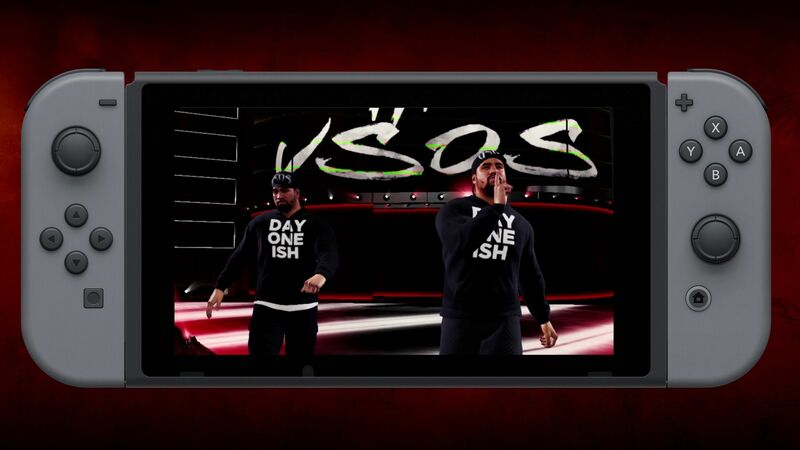 Season Pass content appears in the Nintendo eShop for download on WWE 2K18 product page when DLC item is made available. Pre-order WWE 2K18 on Nintendo Switch today!